In which sector to invest in 2012 ? In which sector to invest in 2012? Meanwhile, major oil companies are price levels below those of 2008. The largest oil producers are valued at 7-10 times earnings with a dividend of 3 to 7%, the cap often less than the value of net assets and the peak oil perspective long term .. 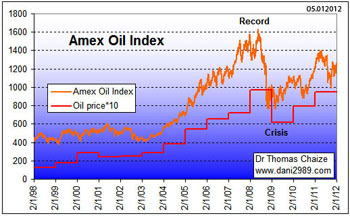 The Amex Oil Index is the index of major oil companies. The situation of junior oil is even more interesting since you have many, many juniors who are at price levels similar to those of the 2008-9 crisis. While the level of risk "geologic" and "politics" is very high, but the potential gain in the event of drilling success is always up. There is no guarantee the success of drilling, but when the drilling is a good positive development, it is guaranteed by many buyers. Today, these juniors are forced to go to remote geographical areas, extreme weather conditions, sometimes chaotic geopolitical situations and the technical complex. That worries investors, but they are the last places where there is oil to be discovered. This is because it is becoming more complex finding oil it is worth investing in this sector. If it were enough to plant a tube into the soil in the bottom of a garden's potential gains would be limited. There is an intermediate category of medium-sized companies, which produce oil and make exploration. These companies can increase their oil reserves as significant enough to ensure rapid growth of capitalization. You have the security of production and exploration of the lever. But these companies are as scarce as oil, because they are the targets of takeover bids for 10 years. 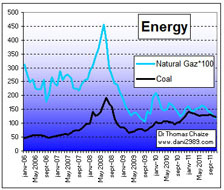 You understood my investment sector for 2012 (and beyond) is the oil and by extension the entire energy: coal, dam, gas, LNG, green energy ... Attention, only when the right conditions, avoid the mirages in the desert, too indebted companies and gigantic projects unfeasible. Do not forget other areas such as industrial metals (copper, zinc, lithium ...), precious metals (gold, silver, platinum), agriculture (potash, phosphate ...), diamond, etc.. But be very careful in timing, buying at the wrong time in the right area can waste a lot of time. Black gold is the major axis of investment for 2012 and future years. Oil and energy are like the foundations of the building, followed by other commodities according to the opportunities.